Player registration for the Spring 2019 Season is now closed. We are no longer accepting umpires for the Spring 2019 season. New umpire training will be held on Thursday, April 11th, at 6pm in the Boxborough Library. New umpires are required to attend, and any previous umpires who would like a refresher are also welcome. If you have questions about future umpiring opportunities, please email the umpire coordinator at . For general umpiring information, please visit the Umpires Corner page . For general information about our various divisions of play during Spring and Fall and what you can expect, visit our Divisions page. If you have any questions about this site or ABYB in general, please visit our FAQ or contact , who can direct your inquiry to the appropriate board member. The ABYB Board of Directors, in collaboration with Acton-Boxborough Regional High School Head Coach Justin Kessler and the AB Baseball Boosters, are pleased to invite the entire ABYB community to come cheer on the AB Colonials Varsity baseball team as they play the Newton South Lions on Wednesday, May 15th, at 4:00pm at the AB High School field. With a pre-paid admission of $15, you will receive an AB Colonials Baseball Car Magnet, hot dog, chips, and drink before the game. Additional Colonials Baseball clothing items will also be available for purchase. 100% of the proceeds from ABYB Night will go toward ABYB/AB High School baseball programs. An ABYB representative will throw out the honorary first pitch, and all ABYB players will join the Colonials team on the field for a brief ceremony during the "4th inning stretch." All orders that include Colonials clothing items must be received by April 17th, 2019. You may order the car magnet/game meal combo until May 5th. Purchasers need to bring a printout of your order receipt to the game in order to collect your Colonials items and meal. General attendance at the game is open to the entire ABYB community even if you do not make a purchase, so please come out to show your support of ABYB and the High School team! Acton-Boxborough Youth Baseball (ABYB), in concert with the Acton-Boxboro Regional High School Baseball Team, is once again providing the opportunity for AB youth baseball players in the Minor B and Minor A divisions to serve as batboys (or batgirls) for all HOME games. 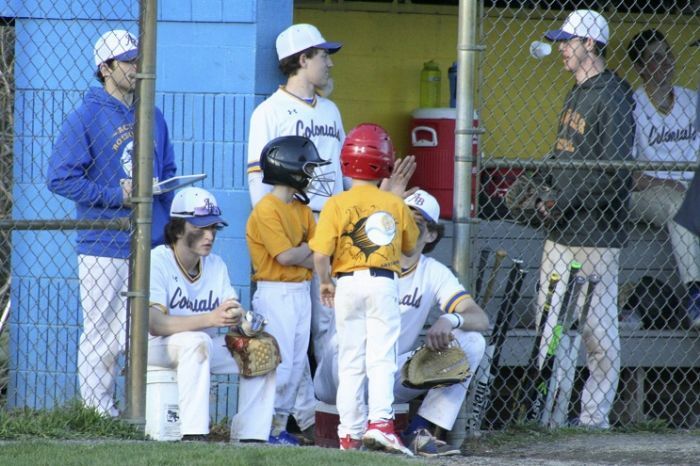 The ABRHS Batboy program continues to be extremely successful. If your child would like to participate alone or with a friend, check out the game schedule and send an email to to sign up. Note: All games are now taken. Waitlist only for now. If any areas are soggy, please stay away from those areas. In the event of rain, please refrain from using the fields. As always, be sure to replace tarps if you remove them when using the fields. Infield, mound and home plate areas should be raked after use. Remember to always rake basepaths in the direction of the runners, not towards the grass edges of the field. Home plate and the mound should be raked either in a circular fashion or from the edges towards the center of the circle, not towards the edges. If you have any questions about field maintenance or our field use policy in inclement weather, please see the Field Maintenance page of our web site. The ABYB Board established a Rules committee to review rules and guidelines that ABYB uses that modify Little League rules. ABYB and other local sports organizations received this quoted information from Acton-Boxborough Community Education. Please read and follow the guidelines included. "The Acton Police Department will be stepping up its monitoring of all school areas and will be ticketing any cars found to be parked illegally. 2. anywhere the curb is painted yellow, as this denotes a no parking zone. Only cars with handicapped accessible placards may park in handicapped parking spaces. Nor can you park BETWEEN two handicapped spots. If you have any questions, I recommend you contact the Acton Police Department." McCarthy-Towne field is a specific point of concern. We have been informed that the entry road to the Parker Damon building can be considered a fire lane (I had been warned personally by the APD when I coached Minor C), and parking along the curb on this road can therefore be considered a violation. Additionally, parking half on the sidewalk is illegal. Please park in lined spaces in the parking lot. Douglas School field is on Elm Street, and posted signs indicate no parking is allowed on Elm Street. APD enforces this in routine patrols for both the t-ball field and the basketball courts. Park in lined spaces in the Douglas school lot or park at the Elm Street tennis courts. Holiday Inn parking is in the Holiday Inn lot in lined spaces. Even if you can find the entrance to the dirt access road used by the mowing crew, no parking on the field is allowed during ABYB events. Hart Field and MacPherson Field visitors should park in the lined spaces in the Conant school lot. The dirt roads leading to the fields are for emergency vehicles. Veterans Field visitors may find the parking lot crowded when two games are on simultaneously. Overflow parking along Route 27 is questionable: at times cars have been ticketed and we do not have clear resolution from APD. It is safer to park across the intersection in the CVS plaza and use the crosswalks to return to the field. High School 1 & 2 visitors must park in legal spaces. After school hours, marked faculty spaces are available to all parkers, but illegal spaces, yellow curb parking, and handicap parking are still enforced. Hopefully the information above is clear. Feel free to email me with any questions and I will try to seek clarification from the Acton or Boxborough Police Departments if necessary. 5.4.1 If the illegal bat is identified and replaced before an at-bat has concluded, there is no penalty. 5.4.2 If the illegal bat is identified after an at-bat has concluded but before a pitch has been thrown to the following batter, the batter using the illegal bat shall be declared out, and all baserunners shall be returned to the bases they occupied prior to the final pitch. 5.4.3 If the illegal bat is identified after the at-bat has concluded and after a pitch has been thrown to the following batter, the result of the at-bat stands. ABYB Note: As of Fall 2014, in ABYB's internal fall Babe Ruth league, 13-yr-old players are allowed to use bats with at most a -7 length to weight difference (“Drop 7”). In the spring and summer, Minuteman rules allow only a Drop 3 bat, regardless of age. New to ABYB? Moving up to a new division this season? Read descriptions of each of the divisions: T-ball, Minor C, Minor B, Minor A, Majors, and Babe Ruth here! To be recognized and respected as the leading youth sports organization in Acton and Boxborough. ABYB is a parent and volunteer organization committed to building an appreciation for the game of baseball through quality coaching and parental support & involvement. ABYB will strive to offer high quality baseball throughout the entire ABYB program. It is the objective of the ABYB program to create an environment that is safe, provides an opportunity for all players from T-Ball through the Majors and Babe Ruth divisions to develop skills and game knowledge, allows all players to experience the success they are capable of achieving, and teaches the life-long lessons of sportsmanship, teamwork, fair play, and respect for others. ABYB’s spring T-Ball through Babe Ruth programs provides an opportunity for players to develop skills in a competitive environment whereas the fall programs focus on development in a less competitive environment. ABYB offers summer all-star programs. These programs provide an opportunity to experience the best coaching available and maximize player potential, in a competitive, inter-town environment. ABYB offers summer intermediate programs for players who wish to play baseball in a less competitive inter-town environment. It is the responsibility of all ABYB League officials, including the Board of Directors, coaches, umpires and parent volunteers, to understand and fulfill these objectives. “These are truly exciting times for ABYB. These guiding principles will help make ABYB the leading youth sports organization in Acton and Boxborough”, said Sanjay Khosla, President of ABYB. “Over the next several months the Board will be taking initial steps towards further developing existing programs and establishing new ones to achieve our vision. We look forward to the support and involvement of ABYB players, parents and coaches,” said Khosla. If you have any questions or comments regarding the new Vision and/or Mission statement please don’t hesitate to inquire. Further, if you are interested in serving on the ABYB Board please let us know. Several positions are available. Are you interested in supporting ABYB during the 2018 spring, summer, and fall seasons? If you are a 2018 sponsor and we do not list you here, we apologize, and please contact the webmaster to get listed properly!